Last night, millions tuned in to watch the Vice-President Joe Biden and Congressman Paul Ryan square off at Centre College in Danville, KY. Viewer expectations were mixed, with those on the right anxious to get a first look at Paul Ryan’s debating prowess, and viewers on the left wanting to see Biden bring a tougher challenge than the President did in his first debate against challenger Mitt Romney. What no one expected to see, however, was how the debate played out. Connie is referring to an event at the end of the debate. 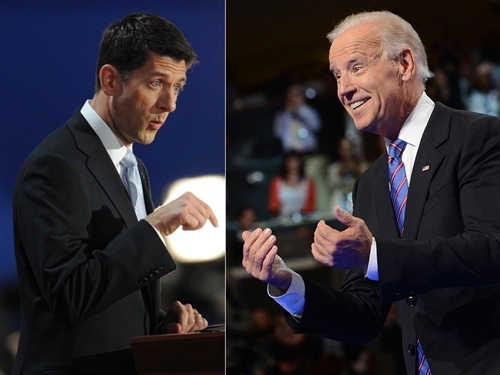 The event began when Biden approached Ryan to shake hands. 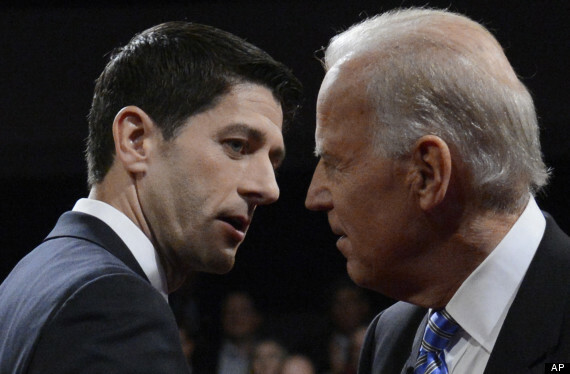 When the two gripped one another, the sweat still heavy on their brows from the hot lights and the hour spent vigorously at odds with one another, their eyes locked and they stood there, the auditorium still, until Biden reached his free hand up to caress Ryan’s cheek. In a swift, explosive move that brought Secret Service Agents rushing to the stage, the Republican Congressman threw an arm around the Vice-President’s waist and drew him into a long, passionate kiss. Following the debate, the two held hands as they ran through the hallways of Centre College, darting this way and that to avoid the media and the Secret Service, before security cameras caught them slipping out through the cafeteria. Once outside, the two hopped onto Biden’s vintage Harley-Davidson motorcycle, where Ryan slipped his arms around Biden’s waist and rested his head on the VP’s shoulder. They drove off into the night. Their whereabouts are still unknown. Brad C. Hodson is a writer living in Los Angeles. His first novel, DARLING, can be purchased from Amazon or directly from the publisher. For more of his work, check out his Bibliography. I know you write horror, Brad, but after reading this I’ll be having nightmares for weeks to come. Seriously, though, good stuff. Keep it up! Seriously, you made my day. Brilliant! Glad to help, Jay! The odd thing is, I started this blog to promote a horror novel being released this month. But the political state of the country just BEGS for these articles right now.